Follow these simple instructions and you will enjoy your hardwood floor for many years. When necessary, regularly vacuum, sweep or dry-dust mop your floor as often as required to remove dust, soil or grit (sand and small stones) which can act like sandpaper and scratch your floor. Do not use a vacuum with a beater bar or power rotary brush head as it will scratch the wood. If your floor needs cleaning from time to time, spray a small amount of hardwood floor cleaner directly on the terry cloth mop head, not onto the floor. 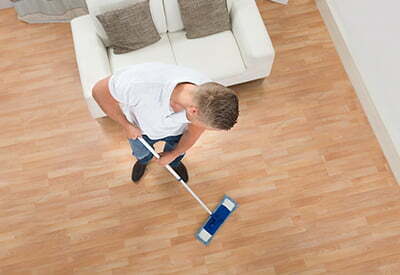 Use a back and forth motion with the mop in the direction of the length of the floor boards to prevent streaking. Never wax the floor. Never clean your floor with water or any cleaner that must be mixed with water as the same will void this warranty. Wipe up soil and spills promptly using the cleaner and a clean cloth. Water and wood do not mix. Water can and will cause damage to the finish and integral structure of wood flooring. Steam cleaners contain water, do not use on wood floors. Do not place potted plants directly in contact with hardwood floors. Floor mats at entrance ways and on all high traffic areas will keep soil and moisture from being tracked on your floor. Use of high quality mats and rugs will prevent damage to or discolouration of the floor. Note however, that when mats and rugs are placed directly onto hardwood flooring, they will abrade the flooring because they move around when they are walked on. As dirt and sand build up under the rug the constant movement of the rug will grind those small particles into the wood finish. They also pose an obvious slip, trip and fall hazard in the household. Only those mats with proper gripping backs should be used where elderly or infirm occupants will walk over the area in question. For rugs that do not have a gripping back, rug pads work well to protect your floor and keep rugs from moving around. Attach felt pads to all furniture and objects that will rest on your floor. This will help to prevent scratches and make your furniture easier to move when you want to clean your floor. Over time, exposure to sunlight will bring about minor changes in color to the hardwood floor. This colour change is caused by oxidation of the wood fibers, and is not considered a defect. Move your rugs occasionally to avoid uneven colour of your wood flooring due to strong UV light. Use protection like a blanket, towel, or carpet face-down underneath all furniture or appliances to be moved in order to avoid scratching and permanently denting the floor. Replace narrow hard chair rollers with wide non-marking rubber rollers. Never allow persons wearing spiked high heel shoes to walk on this floor. All wood has an equilibrium moisture content based on the humidity of the air surrounding the wood. As the relative humidity surrounding the wood changes, the equilibrium moisture content changes. As the moisture content changes, wood will grow or shrink in size. By keeping the relative humidity level in your house between 35% and 50% throughout the seasons, your hardwood floorings’ equilibrium moisture content will remain balanced with the way it was manufactured. Once the relative humidity goes outside this range, you will start to see cupping and gapping. Cupping occurs when the bottom of the wood floor remains wetter than the top surface due to high humidity or exposure to water. Please monitor relative humidity in your basement or crawl space to prevent this. This type of cupping will often come back when the relative humidity drops, but this isn’t always the case. Gaps appear between boards as moisture leaves the floor to the surrounding air. These gaps will close up again as the relative humidity increases.